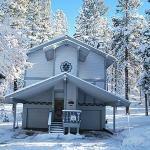 Featuring a sauna Pine Hill Road Holiday home 2 is set in South Lake Tahoe. This holiday home is 1.5 km from Tahoe Queen and 1.8 km from Heavenly Ski Resort. This 2-bedroom holiday home comes with a kitchen a seating area and a TV and DVD player. The property has a sauna. An outdoor swimming pool and barbecue facilities are available for guests at the holiday home to use. Popular points of interest near Pine Hill Road South Lake Tahoe include Aerial Tramway World Cup and Gondola. Reno-Tahoe International Airport is 64 km from the property.